Hail tracking for contractors is now faster, easier and affordable with SWIFT Weather’s new real-time Hail Alerts with a street-level preview delivered directly to a contractor’s email inbox within minutes of hailstorm damage occurring. A 30 day trial of Hail Alerts is available for only $1, there are no contracts, and users can cancel at any time. Hail Alerts are delivered to a contractor’s email in real-time enabling them to quickly locate residential and commercial properties which need their services after experiencing hailstorm damage. “This is hands-down the easiest, most affordable way to stay on top of developing hail storms and respond more quickly than anyone else,” said SWIFT Weather CEO Rory Groves. SWIFT Weather’s new Hail Alerts available on LiveHailReports.com is now the fastest, easiest and most affordable way for contractors to receive hail tracking information. The new Hail Alert feature of the online weather-tracking product suite, from the award-winning weather software developer, lets users select their state and hail size – from 0.5 inches or larger to 4.0 inches or larger – or just all sizes of hailstones. Hail Alerts are then delivered directly to a contractor’s email inbox in real-time enabling them to quickly locate residential and commercial properties which need their services after experiencing hailstorm damage. Street-level preview graphics show exactly where the impending hail storm has hit – giving contractors a head start when contacting businesses and homeowners who may have received hail storm damage. “This is hands-down the easiest, most affordable way to stay on top of developing hail storms and respond more quickly than anyone else,” said SWIFT Weather CEO Rory Groves. “Contractors seeking a competitive edge will benefit from having Hail Alerts delivered directly to their email inbox with street-level maps. Plus with our 30 day special $1 trial – we’ve made it so everyone can afford to try our new weather-tracking product,” concluded Groves. All LiveHailReports.com’s products are web-based software and compatible with any computer. 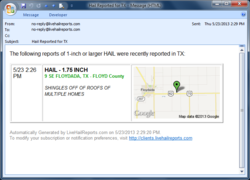 In addition to the new real-time Hail Alerts feature, LiveHailReports.com offers contractors easy-to-use, printer-friendly Summary Reports which allow the user to find any hail, wind or tornado report in the last five years up to the present. Street-level graphics show exactly where the hail fell and the simple online search by city and date lets contractors find individual storms or all storms for a selected city. Historical Hail Data web-based interface product allows users to look up a year’s worth of hailstorm damage reports at one time. Quickly browse through a listing of hail reports for a particular state and plot over an interactive map and export data to Microsoft Excel or Google Earth. Anyone can try the new real-time Hail Alerts for 30 days for only $1. If users decide to keep the service, the cost is $49.95 per month. There are no contracts and users can cancel at any time. Visit http://livehailreports.com/hail-alerts for more information or to purchase. SWIFT Weather’s new Hail Alerts available on LiveHailReports.com is now the fastest, easiest and most affordable way for contractors to receive hail tracking information.